I love to bake with my kids and these remind me of something I'd make with my mom and grandma when I was younger. Comfort food at it's finest! Enjoy! My girls helping with their own dough. Preheat oven to 350° Spray cookie sheet with cooking spray and set aside. Let your ready made dough sit on the counter for a few minutes to soften. Lay dough out and cut circles with a cookie cutter, or a kitchen glass. Lay the circle onto your cookie sheet. Place about 2 Tablespoons of pie filling in the center of each circle. Lay a candy stick onto the circle and gently press down. 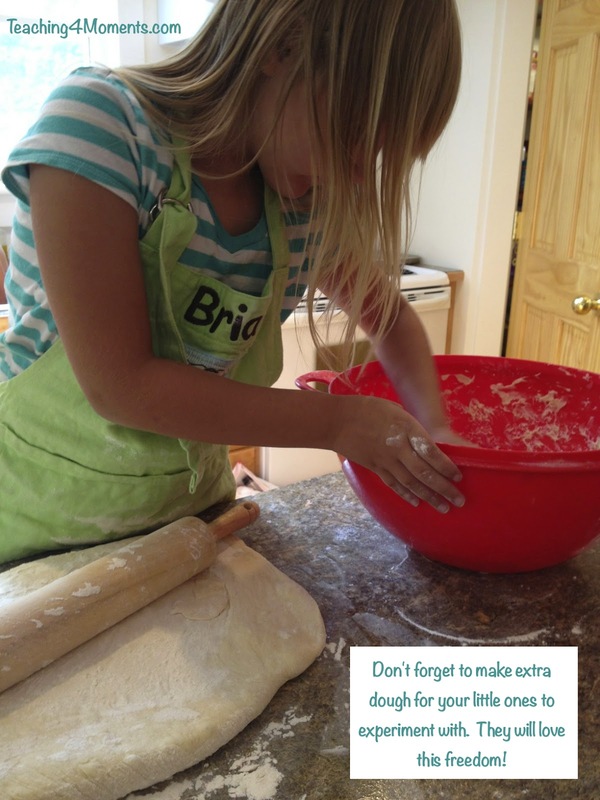 Make sure you put enough of the stick into the circle to keep it from coming out too easily after baking. Place another circle on top of the filling and candy stick. If you wish to have cutouts for this top crust, do so before placing on top of the filling. Press the sides gently down, making sure to cover all of the pie filling. Take the end of one of the candy sticks and press down around the edges of the entire pie. This will give the ripple effect on the crust. Make sure the pie is sealed and that the stick is secure. Whip 2 eggs whites with a tsp of water and spread on top of each of the pies. Before it dries, sprinkle raw sugar over the entire pie. I like to be generous with the sugar. Yum! Bake for about 9 minutes or until the pies are golden brown. Transfer pies carefully to a cookie sheet and allow them to completely cool before trying to hold them by the stick. That's it! 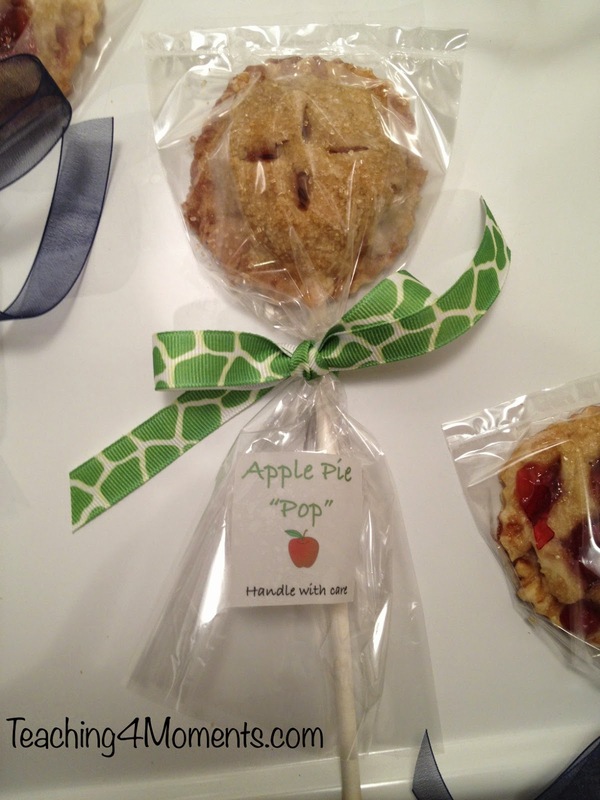 My favorite flavor has been Apple, where I use fresh apples, butter, cinnamon and sugar as the filling. It's delicious, but keep in mind it will take more time. Using homemade dough works great as well, but again, it will just take a bit more time. I've also made them without the stick, and they're just as good. 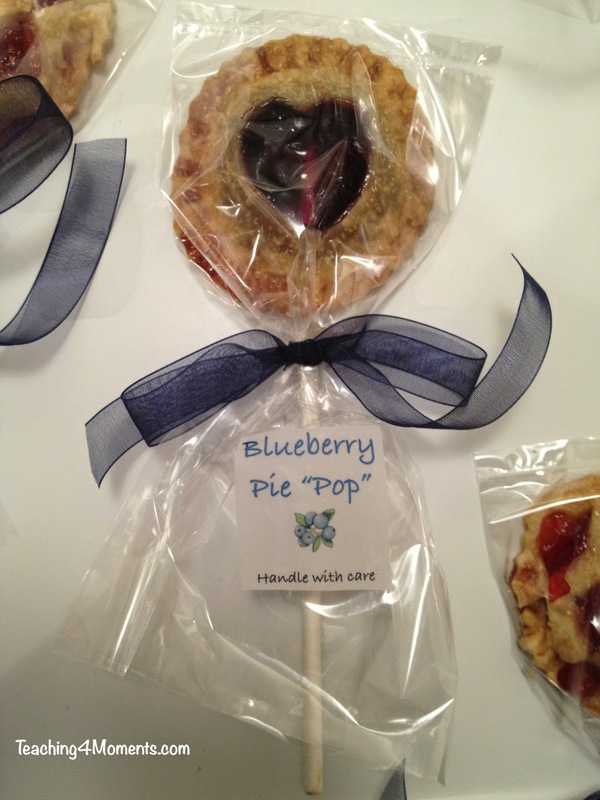 It will eliminate your stress if you're worried about the pie falling off of the stick. They are surprisingly sturdy, though. 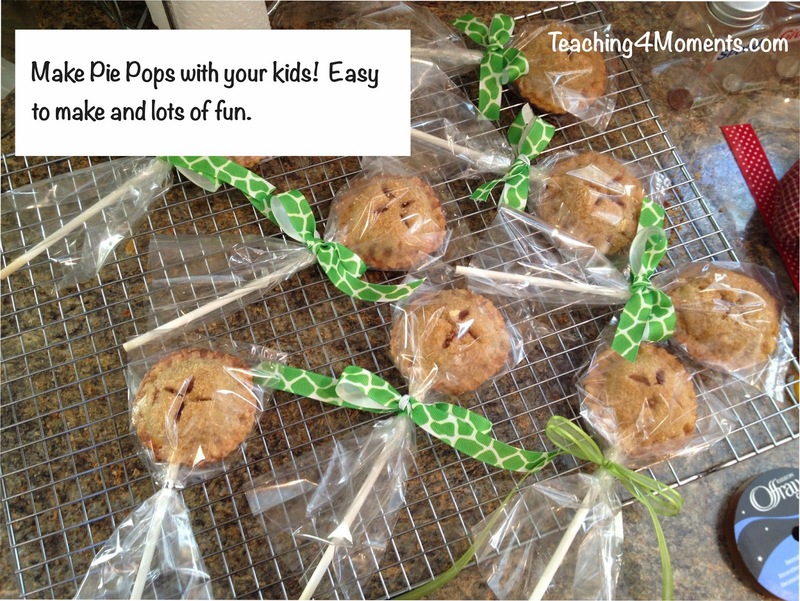 If you'll be placing them into a plastic bag, give them plenty of time to cool off. If you block off the airflow too soon or for too long, the crust will become soft. 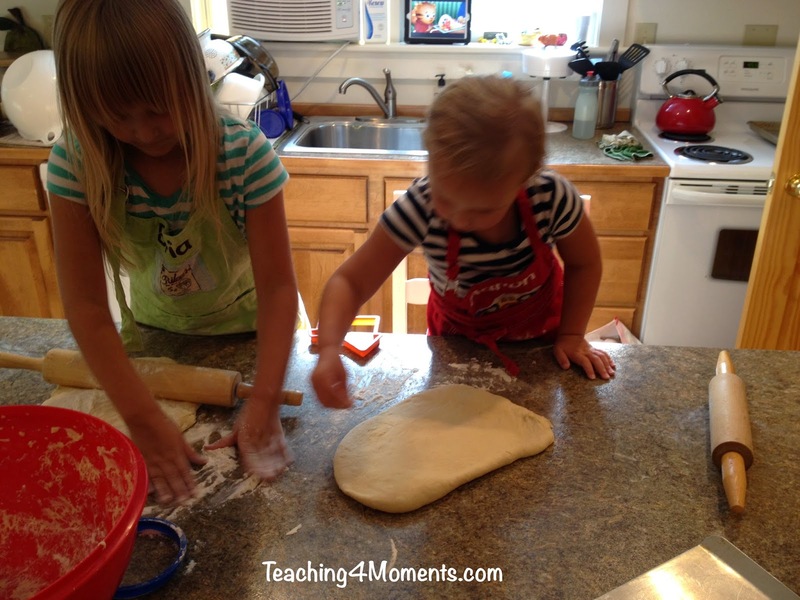 Don't forget to have extra dough around for the kids to roll out and create with. They love to have this freedom! 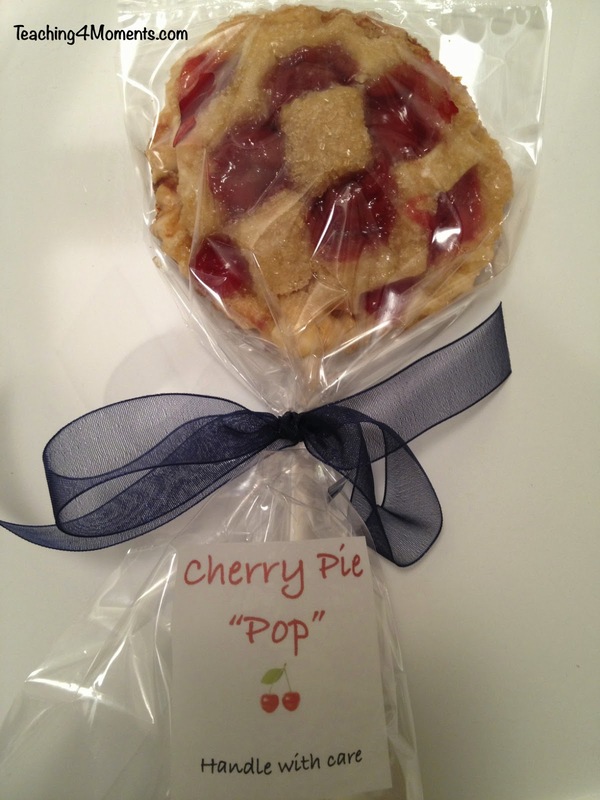 Visit my TpT store to download the Labels I used on my pies (FREE). I printed them on clear labels and cut them to the size that I wanted.